Premium milk chocolate chips melt into perfect chocolate fondue for chocolate fountains and make great chocolate chip cookies, too! All natural ingredients. Gluten and transfat free. Kosher dairy. Perfect for chocolate fountains! Sephra Premium Milk Chocolate fondue is specially formulated couverture chocolate developed for use in commercial chocolate fountains and home chocolate fountains. Sephra's Premium fondue chocolate is packaged in 2 lb. bags for convenient portion control and for better product shelf life. Sephra's Premium Milk Chocolate is the best baking chocolate for all your baking needs, including your favorite chocolate chip cookie recipe. You will be amazed at the difference in taste! These make the most delicious chocolate chip cookies. NOTE: For candy making chocolate which will harden quickly when molding or dipping food items, such as chocolate covered strawberries, try our Sephra Melts. Made in the USA from all natural ingredients and kosher certified. Contains no hydrogenated oils or substituted vegetable fats. 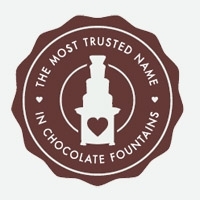 No extra ingredients needed - Chocolate fountain ready. 33% Cocoa Solids, Contains ten (10) 2lb bags. This is the best tasting chocolate in the world.